The Natural Resources Defense Council (NRDC) and the Environmental Defense Center (EDC) today announced they have sued the Environmental Protection Agency (EPA) to strengthen standards to prevent pollution from stormwater, one of the nation’s most widespread forms of water pollution. More than a decade ago a federal appeals court ordered EPA to strengthen those protections, but the agency has failed to take action. EDC filed a lawsuit today challenging the Bureau of Safety and Environmental Enforcement’s (“BSEE”) failure to provide for public or environmental review prior to approving 51 oil drilling permits authorizing the use of acid well stimulation (“acidizing”) and hydraulic fracturing (“fracking”) from offshore oil platforms located in the Santa Barbara Channel. Watershed and fish advocacy organization California Trout, represented by the Environmental Defense Center (EDC), filed a lawsuit on October 6th in federal district court in Los Angeles against the United States Bureau of Reclamation (Bureau). The lawsuit alleges that the Bureau violated the federal Endangered Species Act (ESA) by causing the deaths of hundreds of endangered Southern California steelhead trout (Oncorhynchus mykiss) at Hilton Creek, below the Bradbury Dam and Cachuma Reservoir in Santa Barbara County. California Sportfishing Protection Alliance (“CSPA”) and Environmental Defense Center (“EDC”) notified A-1 Metals & Auto Salvage on Monday of their intent to sue the Facility for violating the Clean Water Act. The notice letter alleges that the Facility is illegally discharging pollutants, including copper and lead, into the Salinas River. The A1-Metals auto-dismantling and salvage yard is located in an environmentally-important area near the Salinas River, which flows into the Monterey Bay. The Salinas River watershed is critical to central coast communities’ health and recreation, and is home to numerous endangered species. EDC today announced the release of “Urban Agriculture in the Goleta Valley,” a report profiling some of the few remaining productive urban farms in the Goleta Valley, many of which are being threatened by potentially being rezoned and developed as part of the Eastern Goleta Valley Community Plan Update (Plan). Located within Santa Barbara County, Goleta Valley’s urban agriculture not only provides critical benefits to human health and well-being and the environment, but also contributes to the County’s $3 billion agriculture industry. EDC demonstrates the critical need for these farmlands and encourages community members to voice support for their conservation. The Ventura County Air Pollution Control District (VCAPCD) Board approved today the VCAPCD’s participation in a coalition of four government, non-profit and marine industry groups in their trial incentive program underway in the Santa Barbara Channel since July 1st. The program will slow down cargo ships to reduce air pollution and increase the protection of endangered whales. The Fess Parker Doubletree in Santa Barbara was investigated and found in violation of regulations related to its poisoning of up to roughly 21 protected and desired bird species at its Cabrillo Boulevard location. After complaints were filed by the Environmental Defense Center (EDC), the California Department of Fish and Wildlife (CDFW) and the Santa Barbara County Agricultural Commissioner investigated this matter and have concluded that the Doubletree applied a bird poison known as Avitrol in bird feeders and illegally used this poison with the intention to control pigeons and sparrows near the hotel’s rotunda. A federal judge with the United States District Court for the Central District of California has approved a settlement agreement between environmental organizations Santa Barbara Channelkeeper and the Environmental Defense Center and the owner of the Ojai Quarry in Ventura County. The environmental organizations’ lawsuit alleged that stormwater management practices at the Quarry were violating requirements of the federal Clean Water Act (CWA) and the California “General Permit” for stormwater discharges from industrial facilities, as well as provisions of the Endangered Species Act (ESA). A coalition of government, non-profit and marine industry groups today announced the launch of a new trial incentive program in the Santa Barbara Channel to slow cargo ships down to reduce air pollution and increase protection of endangered whales. Six global shipping companies, COSCO, Hapag Lloyd, K Line, Maersk Line, Matson, and United Arab Shipping Company are participating in the speed reduction incentive program and have identified ships in their fleets that will transit between Point Conception and the Ports of Los Angeles and Long Beach, from July-October 31, 2014, at speeds of 12 knots or less (reduced from typical speeds of 14-18 knots). 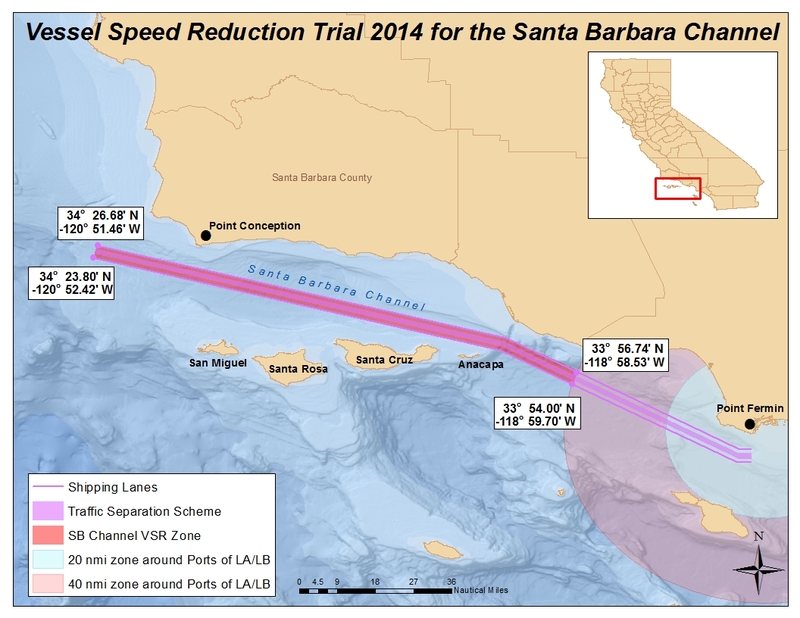 Participating companies will receive $2,500 per transit through the Santa Barbara Channel. On Behalf of California Trout, EDC has sent a 60-day Notice of Violations and Intent to Sue the U.S. Bureau of Reclamation alleging violations of the Endangered Species Act. The letter puts the Bureau on notice for its actions causing deaths of endangered Southern CA Steelhead trout at Hilton Creek, below the Bradbury Dam and Cachuma Reservoir.